Here at the Premier Property Group (PPG), we make it our mission to bring the best in luxury, lifestyle development to the market. 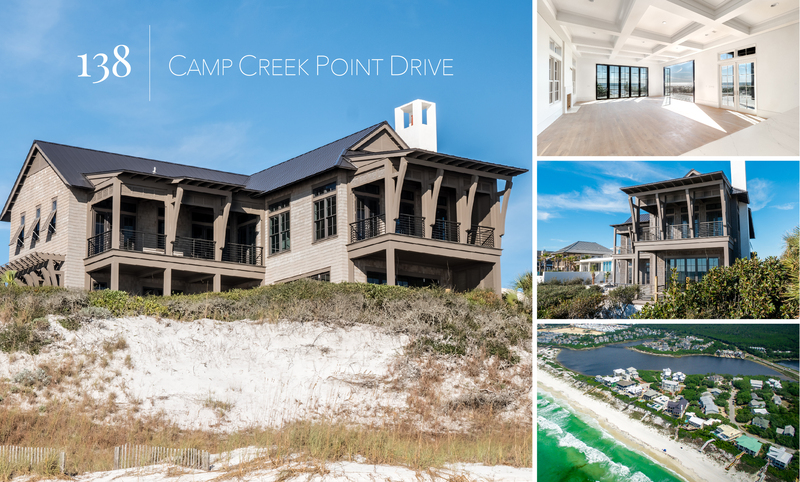 Our team of experts is continually identifying the most exclusive, up-to-date design and refining what it means to experience leading-edge real estate along the Emerald Coast. That’s why we are proud to showcase our latest residential offering at 138 Camp Creek Point Drive —a contemporary, beachfront home with access to more than 130 feet of shoreline. Located just west of Alys Beach on Florida’s famed Highway 30-A, this spacious residence is a study in elegance and features more than 9,400 square feet of total gross area including 6,423 square feet of air-conditioned space and an additional 3,021 square feet of covered outdoor area. Perfect for entertaining, folding glass walls frame the property’s great room overlooking the emerald green waters of the Gulf of Mexico and open to a large covered deck. Coffered 12-foot ceilings and elegant detailing throughout the property are complemented by generous windows and floor-to-ceiling French doors that flood the interiors with an abundance of natural light. Located in a gated, non-rental community, 138 Camp Creek Point Drive features dual Gulf-front master suites, a game room, elevator and three-car garage. In addition, one of the two master suites opens to a terrace complete with a pool and spa. The property houses a total of six bedrooms—four Gulf-front bedrooms including the master suites and a full carriage house with two bedrooms, two baths, and great room and kitchen. The residence also features a large chef’s kitchen complete with 10’-wide island anchors, Sub-Zero and Wolf appliances and a butler’s pantry.138 Camp Creek Point Drive is listed at $9.5 million.